Menu section to make adding your menu simple. Display all your menu groups on one page. Or have a page for each section of your menu. You can use the built-in shortcode to display a menu group anyplace you’d like to. Add links to 11 social network sites. Add any other network of your choice in the theme options page. Contact widget with your location, hours and map. Custom featured post widget to place your posts on the home page or any sidebar. Responsive video widget, latest Tweets and Facebook like box. 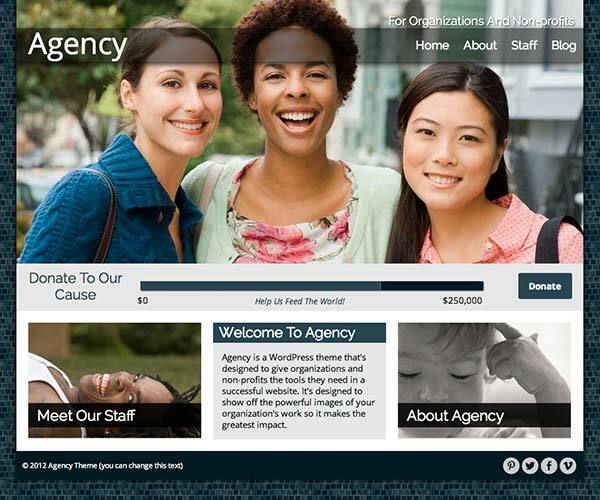 Create lists of your organization’s staff. 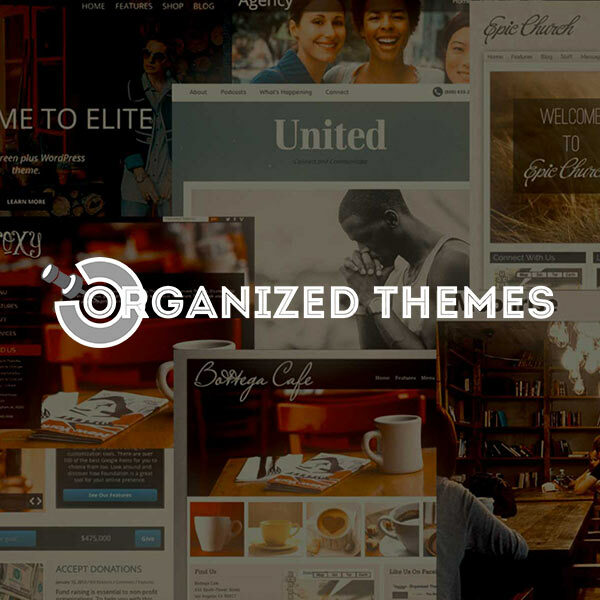 Plus you get quality support you can depend on at Organized Themes. updatedFixed demo's 5 images not showing up on the homepage. 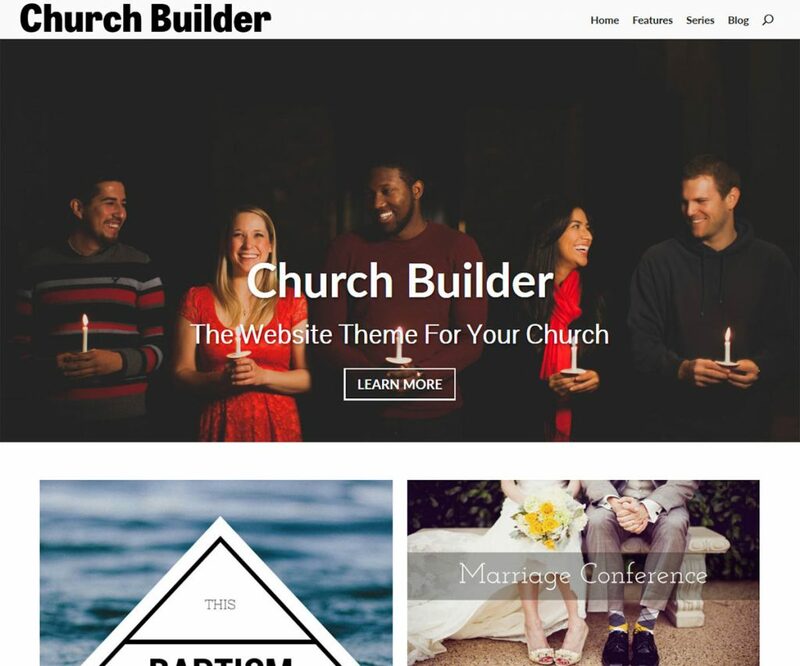 updatedpage-home.php -- changed placement of a tags in featured row. updated/includes/images.php -- wrapped image sizes in function so it can be overwritten. updatedstyle.css -- made boxcaptions 85% width to keep text from overflowing instead of wrapping. updatedstyle.css -- changed ul li to #content ul li, .widget ul li to keep list bullets only in the main content areas. updatedNote: Made the featured row images 167 pixels square. updatedVery significant release. Most theme files changed. The original menu page template has been retired and a new "Full Menu" page template introduced. The theme options page was also reorganized to be more efficient. newincludes/post-types/menu-type.php -- added sorting filter for menu groups. updatedpage-home.php -- changed "video" to "fit-video"
updatedoptions.php -- set default staff slug to "staff"
updatedAdded page-home.php -- optional location to display the_content on the home page. updatedRemoved widget-twitter.php -- Twitter 1.0 API no longer supported. updatedFixed page-menu.php fixed location of post-formats to point to layouts folder. updatedFixed ordering of menu items on menu group page (reflects numerical order now) Height of menu items in list. Took out default height and the bottom margin on the item description. 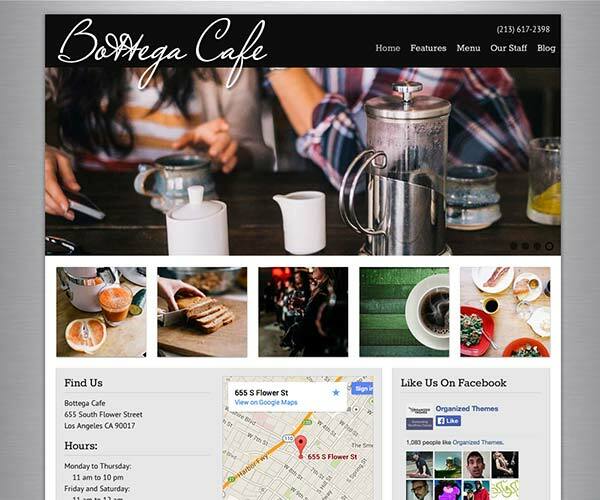 Bottega is a flexible and easy to use theme for restaurants. It has easy menu management so you don't have to upload PDF's of your menus anymore. It's easy to customize with your own logo, colors and style.